It’s made out of a tough but flexible plastic. 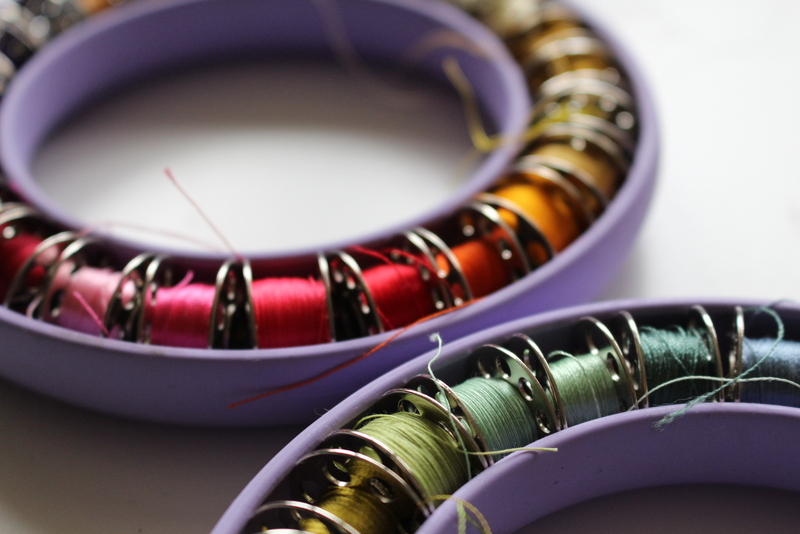 As you see, it’s simple; you just push the bobbins into the ring. 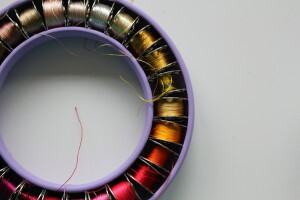 The really clever aspects of the design are that the bobbins don’t fall out, and that the loose ends are secure and the bobbins don’t unravel all over the place. You can hold it upside down – the bobbins stay in place. You can drop it – the bobbins stay in place. You can roll it around the desk or the floor – the bobbins stay in place. You’re getting the idea: the bobbins don’t come out until you pull them out. Simple but brilliant. They’re available in red, blue or, as shown here, lavender. I bought mine from Barnyarns. Good, eh? Incidentally, in case you’re wondering, I’m not on commission. I just like the product. I’ve been wanting a bodkin for quite some time, or at least I thought that was the name for the object I required to make holes in linen and cotton to produce broderie anglaise. Anyhow, I knew when I saw it that this is what I wanted. In essence, it’s a pointy thing with an ornamental handle, and I’ve placed it near a measuring tape so you can see how big it is. 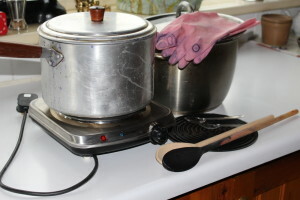 I found this at Ludlow (Shropshire) Sunday market which I can recommend for anyone who likes old stuff and bric-à-brac. (On the whole I don’t, but I make an exception for old items of sewing equipment). Mine for two pounds, which I thought was a very fair price, especially as they were asking 50p per bobbin for old Sylko bobbins (just the bobbin, no thread). 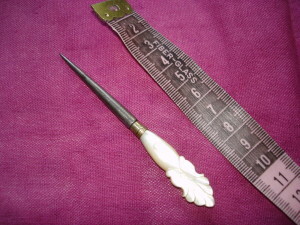 So, next time I do some broderie anglaise I will have the perfect tool. Which brings me back to the question of what it’s called. I looked up bodkins on Google Images and there are several tools there that don’t look like this one – they’re more like big tweezers for pulling elastic through waistbands, or alternatively big needles with eyes. However, looking further I can see the word has several different definitions, one of which is ‘A small, sharply pointed instrument for making holes in fabric or leather’. So that’s alright then. Whatever it’s called I’m very pleased with it. PS That rather lovely raspberry-coloured background is a piece of recycled linen dyed with cochineal. I’ll be talking more about cochineal in a future post.